It’s 11:11am on the last day of 2014 as I’m writing this post, and reflecting on such an eventful year. I remember this time last year, and all the resolutions and goals I had made for 2014. Some stuck, and some didn’t, and everything turned out a-okay. The year was filled with happiness, sadness, excitement, struggle, love, joy and accomplishment…but most of all, this was a year of learning and growth. 2014 is not a year that will just blend in with other years. The valuable lessons learned this past year will stay fresh in my mind as I tackle new projects in 2015, with bigger, brighter perspectives. In other words, see ya later 2014! So what does any of this have to do with Cave Girl Culture? With YOU? For starters, MORE FOOD. I have a TON of recipes I’ve been saving all year, ready to spam your inbox. But the good kind of spam, not the questionable stuff that pops up when you’re checking personal email at work, and your boss suddenly walks up right behind you. Eek. Second, I’ll be sharing my recipes and experiments with primal dog treats. Because of Jaxson’s megaesophagus and incredibly sensitive digestive system, dog food, treats and feeding routines have been an experiment in itself. If you’re a dog lover, stay tuned for these posts! More information to come in the new year. Let’s start there and see what happens! And thank you, dear reader, for continuing on with me in 2015. I hope you continue to find posts on CGC that inspire you in the kitchen and make you laugh. That’s what it’s all about, right? On that note, let’s get to the food. THE LAST RECIPE OF 2014. Holy crap, that’s weird to say. 2 large white potatoes, cut in large chunks *See note – this only applies if you’re making as an entree. Preheat your oven to 350 degrees and line the baking sheet with foil. While the oven is heating up, put all ingredients (except for the white potato, see note) in the mixing bowl and use your hands to evenly combine the mixture. Wait for about 5 minutes for the coconut flour to absorb the moisture, then form 1 inch meatballs and place on the foil lined baking sheet. Bake in the oven for about 25 minutes or until they’re a light golden brown. *Note: While the meatballs are cooking, you can whip up a nice homemade marinara sauce to go with the meatballs. You have two options here…these can be made as a entree, or an appetizer. The entree features the meatballs and white potatoes in the marinara sauce. If you do this, start boiling the potatoes in a pot of water until tender right before you start your sauce. The appetizer side is a little lighter with the sauce and omits the potatoes completely. Below are directions for both options. *Note: If you’re making the appetizer, you’ll only need 16. oz of tomato sauce. The entree requires more sauce, so a can and a half (approx. 24 oz.) should do the trick! Heat the oil in the skillet over low heat. Add the diced onion and minced garlic to the skillet and saute until the onions are translucent. Add the tomato sauce and seasonings and let simmer for approximately 15 minutes. If you’re making the entree add the potatoes, if not, just add the meatballs and simmer for another 15 minutes. Appetizer: Use a large spoon to scoop out a little sauce and gently place a dollop on a serving plate. Place a meatball over the dollop of sauce and add a toothpick on top. Continue to place dollops of sauce with the meatball on top until your serving plate is filled, approximately 1 inch apart from the next. Entree: This one is easy. 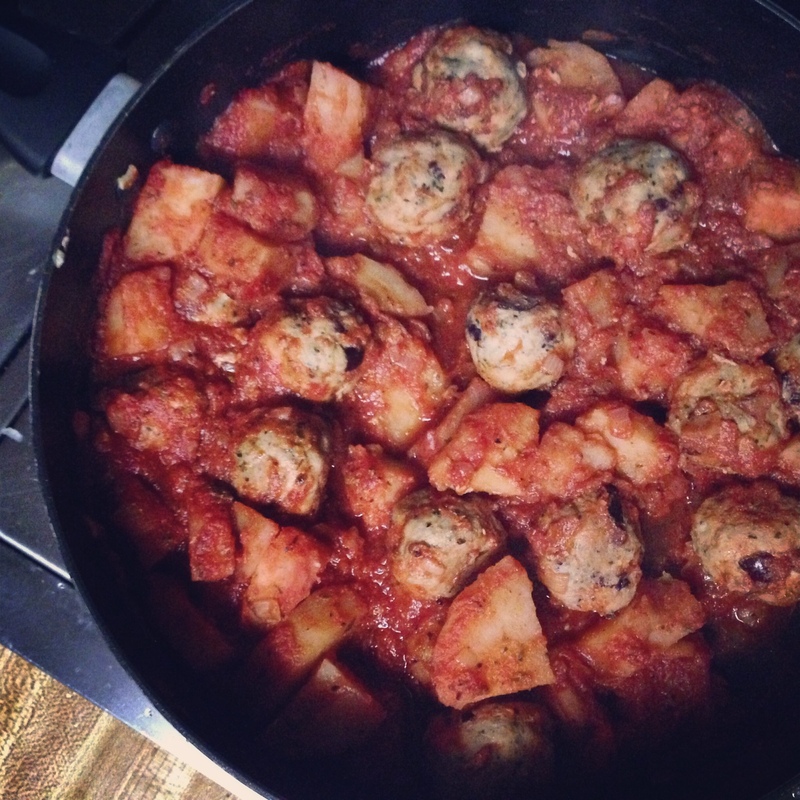 Just spoon a generous portion of meatballs, potato, and sauce into a bowl and serve! The appetizer version of this recipe makes 24 meatballs + sauce. The entree version of this recipe makes approximately 6 servings. If you are following a meal plan, please adjust your servings to fit your meal plan as needed. I’m making these as an appetizer again for an NYE party tonight, so I’ll have more pictures to post on this later. These will go okay with champagne right? I mean, what doesn’t go well with champagne? I’m terrible at pairing my food and alcohol. By the way, I’m declaring champagne / sparkling wine as “paleo” friendly tonight. That’s right I said it. And by paleo friendly, I mean I’m paleo and it’ll be my friend. Tomorrow? Not so much. But isn’t that what Bloody Mary’s are for? I hope everyone has a fun and SAFE New Year celebration! Cheers!